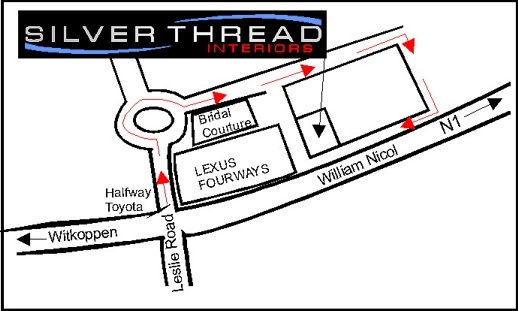 Silver Thread Interiors has relocated to a new showroom. We are still in the same centre at the corner of Leslie Avenue and William Nicol Drive in Fourways, just closer to the entrance and boom gates. We invite you to visit and not only view but also experience the new showroom which offers convenient parking, displays on windows - the way that curtains and blinds should be displayed. We also have motorised curtain tracks and blinds on display so come in to view, operate and PLAY with the remotes! There is a kids area to keeps the little ones entertained snd busy whilst you browse through the products, catalogues and options available. We have also included an outdoor area showing external sun and light control products - these can also be motorised. Wallpaper is displayed throughout the showroom showing anything from simple and understated to bold, 3-d and everything in between. Luxaflex blinds are still in the Luxaflex Gallery showcasing offerings from their local and imported ranges as well as the versatile and durable Luxaflex Shutters. You are welcome to view, operate and experience these - and yes, we have also motorised some of these! One thing that has not changed is our personal assistance and attention to your requirements and detail - still owner run and managed, our family is there to ensure that your family gets what they deserve! Come in and view, discuss with our experienced consultants and interact with products in our showroom.